The name of Richard Hoagland – a bearded Viking warrior, still standing after all these years – is inevitably etched in the minds of all those who have contemplated the possibility that all may not be the way we are led to believe on the Moon and Mars. Informed and opinionated, and proud to have been a steady thorn in NASA's side for over twenty years, Richard makes regular appearances as the Science Adviser on Coast to Coast AM – and has written two books, the most recent of which, Dark Mission, has climbed to near the top of the New York Times best seller list. We visited Richard at his Albuquerque home on two occasions. The first, in December 2006, generated the kind of spirited and wide-ranging restaurant conversation that really should have been captured on video. The second time, a year later, we channeled all our conversation on camera – three hours' worth – and then celebrated with the restaurant conversation afterwards. The three of us were delighted with what we had captured. This interview, in three comprehensive parts, first chronicles Richard's personal journey; then detailed photographic analysis evidencing NASA's deception of the public for decades; and finally his personal views and conclusions about 2012. Richard – articulate, outspoken and controversial as always – packs a huge amount of information into the nearly three hours of edited interview. Whatever your personal views about NASA, the Apollo missions, or the possible real history of our solar system and its exploration past and present, you will find material here that will educate, inform and stimulate, and which cannot be ignored. Click here for a transcript of Part 3 of the video. 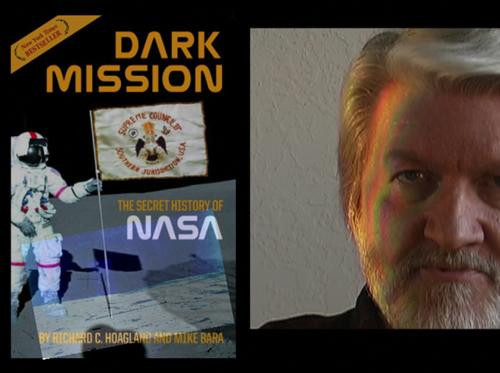 Click here for the comprehensive Amazon review by a former NASA Manned Spaceflight Controller, supporting much of the Dark Mission testimony, which Richard recounts at the very end of Part 3 of the interview. Click here for Richard Hoagland's 'Enterprise Mission' website. Click here for the website of Richard's 'Dark Mission' book. Click here for the Enterprise Mission National Press Club NASA Briefing, 30 October 2007.